On Left is Jason Adams, 1st VP of the FASF and his daughter, Katie, at Right, in front of the Columbus FASF HQ Office. Jason, who lives and works near Las Cruces, NM, made a special trip to Columbus this Monday to give his daughter, Katie, a full-fledged tour of the FASF, its facilities, and its sister (Columbus Historical Society – or “CHS”) organization’s well known Depot Museum, the First Aero’s 1916 Airfield and the historically rich Pancho Villa State Park’s outstanding Exhibit Hall. While Katie reported that she had learned a bit about the infamous raid on Columbus in 1916 by the Mexican Revolutionary, Pancho Villa, she confessed to not knowing much of that tragedies’ details. Katie is only 16, but already looking at colleges, because she is advanced in her classes at High School in Las Cruces. While on this visit, the Columbus, NM Mayor, Philip Skinner and his wife, Diana, officially welcomed both of the visitors and congratulated Jason on his new position on the FASF Board of Trustees. REMEMBER: To see any of these or other FASF photos from this website in full resolution, just click on them. At Left is Katie with her father, Jason, signing the visitor Register at the CHS’ Depot Museum. 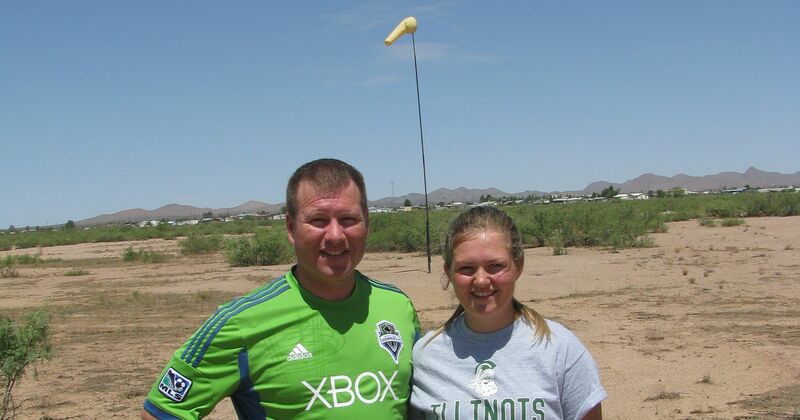 Jason and Katie Adams stand in front of the 1st Aero Squadron’s 1916 Airfield Windsock. The town of Columbus is on the horizon behind them. The Airfield, now the property of the FASF, has a fully graded 2,500′ East – West Runway. 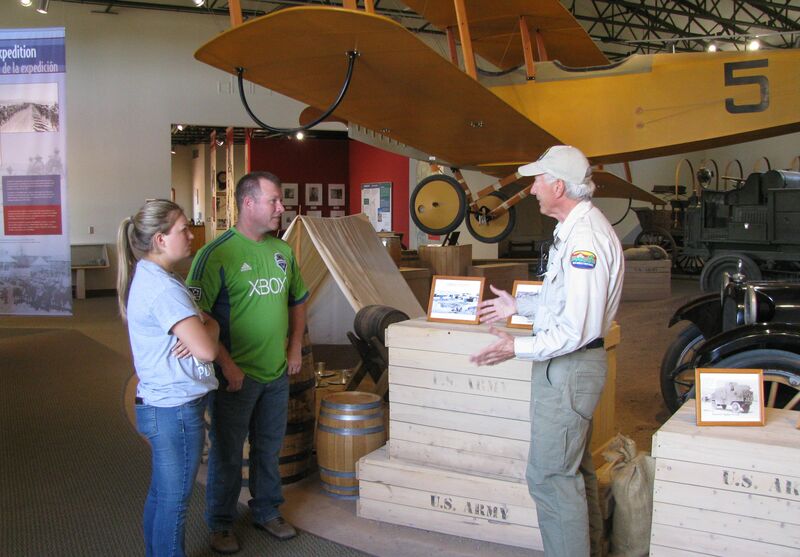 L to R above: Jason and Katie Adams listening to Chief NM Park Ranger and long time active FASF member and volunteer, John Read, as he explains – and shows – the VIP visitors some specific details regarding the typical 1916 U.S. Army Infantry and Cavalry soldier’s belongings. If you haven’t visited this Exhibit Hall, you are missing some fascinating historical relics and other memorabilia of the Punitive Expedition, as well as much about the First Aero Squadron’s Columbus and Mexican Adventures. To easily discover the Pancho Villa State Park’s visiting hours and its special events calendar, simply click right here. L to R: Katie Adams and her Father, Jason, listening to Chief Park Ranger and FASF member, John Read, as he explains some facts about the Punitive Expedition and the infamous Raid on Columbus of March 9, 1916. 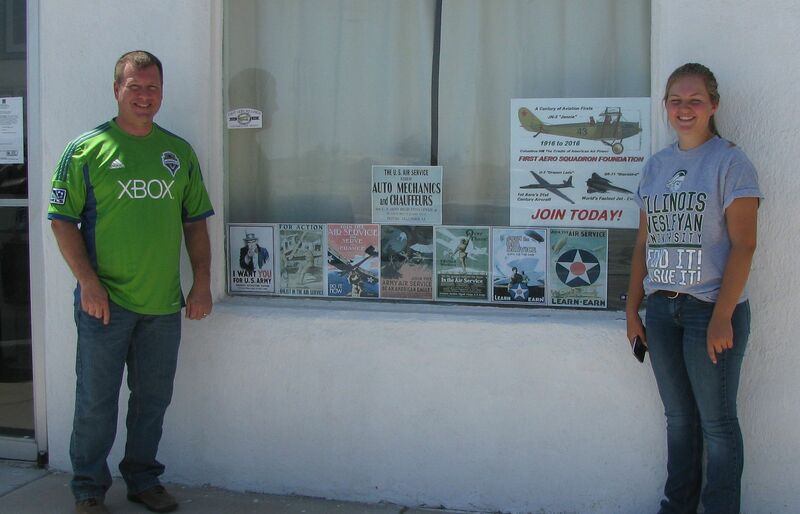 Notice the full-sized replica behind them of Jenny Number 53, which was one of the First Aero Squadron’s Pioneering aircraft. L to R above: Jason Adams and his daughter, Katie (behind him) absorbing a flood of interesting historical information from John Read, about both the Mexican Revolution and its leaders, one of whom was Pancho Villa, the instigator of the infamous Raid which gave birth to the greatest air power on earth. John possesses a wealth of fascinating historical facts and details about the 1916 incident. He explained how Villa had previously been a close ally of the United States, and also why he had felt betrayed by his former Ally, which betrayal Villa then used to justify his disastrous and deadly raid on the town of Columbus. Many visitors to this exceptionally well endowed historical Exhibit Hall and State Park don’t realize some of those historical facts about what allegedly motivated Villa to see the U.S. as his enemy rather than the ally and friend it had once been. L to R above: FASF Trustee and its former 1st VP, Dr. Kathleen Martin; FASF Treasurer, Alma Villezcas; new FASF 1st VP, Jason Adams; and his daughter, Katie, all conversing, after enjoying a luncheon together in Deming, NM, on their way home to Las Cruces, NM. This entry was posted in HOT NEWS! on July 20, 2016 by FASFRIC.